I really didn’t want to write anything more about the ridiculous Lewandowsky / Frontiers fiasco, and hoped that it would quietly fade away following the clear statements from the Frontiers in Psychology journal that explained the retraction of Lewandowsky et al’s ‘Fury’ paper and vindicated the complainants. But the idiocy continues, with a seemingly endless parade of Lewandowsky apologists mindlessly regurgitating the nonsense that they have read in the Guardian or at some green activist blog. A week ago, an article appeared in something called “scholarly kitchen” written by Kent Anderson (left) a journal publisher. Anderson falsely accused the journal of being ‘disingenuous’ in describing the people referred to as subjects. He quoted very selectively from the Frontiers statements, and even tried to make out that the retraction would lead to the end of entire fields of research, such as economics and literature. Anderson falsely stated that the critics were ‘claiming this is part of a conspiracy’ and provided a link, which instead of doing the honest thing (linking to what the critics actually said) goes to a green blog. There is no excuse for Anderson’s misrepresentation of the facts, since comments on an earlier blog he wrote pointed out and corrected his errors. In the comments below, a blog contributor called David Crotty (right) shows even lower standards. He claims “This sort of analysis is common practice” and gives a list of five links, supposedly to support his claim. These links all turn out to be articles about historical figures, such as Thomas Jefferson who died in 1826! Even when commenter Udik points the false analogy, Crotty stubbornly refuses to admit the difference, and repeats Anderson’s absurd claim that “this would make it impossible to do research in fields such as economics, sociology, history”. This would perhaps be unremarkable if Crotty was just a run-of-the-mill activist blogger. But it’s quite worrying that he is in fact a senior editor with Oxford University Press. Yesterday an article appeared at Discover blogs by an anonymous blogger calling himself “Neuroskeptic”. I came across him at retraction watch, where following a comment linking to Climate Audit and WUWT, he made the statement that “Neither of those are respected blogs, even within the climate-skeptic sphere.” This intrigued me – why would anyone make a fool of himself by making a statement that everyone including himself knows is untrue? In his Discovery article he notes the change of tone from the first Frontiers statement suggesting there were no ethical issues to the second saying that there were. Presumably he’s unaware that he first one was written jointly with Lewandowsky himself. He tries to claim that the people referred to in the paper are not subjects or participants at all, using the absurd argument that the ‘Fury’ authors did not use the word ‘subjects’. Neuroskeptic does not seem to have bothered to look at any ethical guidelines for psychological research, such as these at UWA (Lewandowsky’s former university) that make it clear that participants include anyone who is identified in a record or databank. Rather than check any facts, or rely on the judgement of the journal editors who investigated the situation carefully for a year, he prefers his own ill-informed opinion. In a previous post I drew attention to a 2013 paper by a team of climate scientists claiming “forecast skill” in decadal predictions, following a paper predicting 0.3C of warming from 2004-14, which of course turned out to be completely wrong. Several recent climate science papers have referred to “predictions” and their “skill”. In fact, these are hindcasts, not predictions, in what appear to be more examples of climate scientists fooling themselves. Decadal climate predictions for the period 1901-2010 with a coupled climate model is in Geophysical Research Letters. The climate models in this paper fit quite well for the Atlantic, but not well in the Pacific, which seems a bit like saying that predicting a coin will come down as heads works well some of the time. Skilful Long Range Prediction of European and North American Winters has 22 authors and is in the same journal. In a double you-couldn’t-make-it-up, (a) the authors are from the Met Office – the people who predicted the “barbecue summer” and who thought that the 2013/14 winter would be drier than usual, and (b) some of the authors are the same as those who responsible for the completely wrong global forecast mentioned above. The claim that the Met Office will now be able to do accurate long-range winter forecasts was enthusiastically reported by the gullible media, though commenters were less impressed, noting that the Telegraph article was written on April 1. Another example is this post by Michael Tsamados at the Climate Lab Book blog. This refers to a paper in Nature claiming that the September Arctic sea ice minimum can be “predicted” with “skill” by looking at melt ponds in Spring (May). Confusingly, some results are called forecasts and some are called hindcasts – in reality they are all, of course, hindcasts. It’s interesting that none of these papers make any real predictions. Perhaps they have learnt lessons from Smith et al 2007. Tsamados tells me that his group will be making an Arctic ice prediction in early June. The lowest and least accurate prediction, 3.4 million square kilometres, was from the Met Office (remember, these are the people who keep claiming that their predictions are skillful). Most of the other climate scientist groups made predictions of around 4.1. The sceptical blog Watts Up With That predicted 4.8, and the actual result was about 5.3 (of course, in the previous year, 2012, the minimum ice extent was very low and all the estimates were wrong in the other direction). This chart does not include the predictions of more extreme climate scientists such as Paul Beckwith, who predicted that the ice would disappear completely in 2013, or Marshall Shepherd, president of the American Meteorological Society, who gave a talk repeating this prediction (“Some scientists project that by the end of this summer the Arctic in the warm season will be totally ice-free”), misleading his TED audience. Meanwhile, retraction watch tells us that another paper claiming high forecast skill in the prediction of European winters based on Arctic ice extent has been retracted (although the fact that it has been retracted is not immediately obvious from the paper at Nature). In a previous post I drew attention to the misleading exaggerated claims about climate change made by the Chief Scientific Adviser Sir Mark Walport in a talk to the public. Well, he’s at it again. In an interview for the Glasgow Science Centre, he says that there is absolutely no doubt about man-made climate change, and that there is a “dramatic change” caused by human carbon emissions. He uses the vague and scientifically meaningless term “climate disruption” and says “we are seeing more drought”. 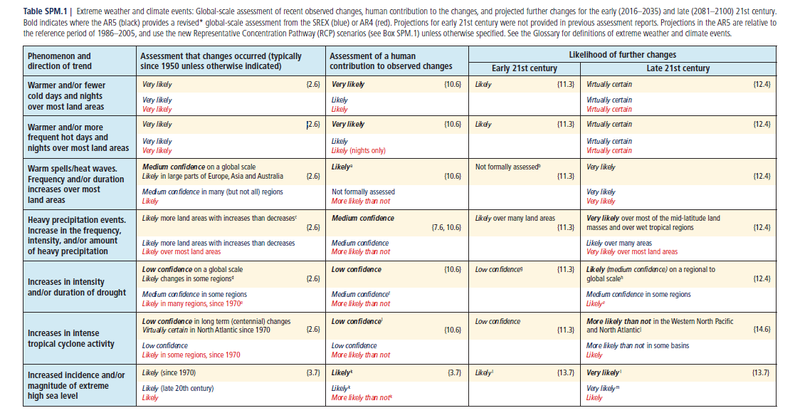 In the IPCC AR5 WG1 Summary for Policymakers, Table SPM1 says that there is low confidence in any global change in droughts. In fact the IPCC says that droughts have increased in some areas but decreased in others, and that the AR4 claims about increasing droughts were probably overstated. Why has our Chief Scientific Adviser not even read the latest IPCC SPM? Oliver Geden, an energy and climate policy analyst from Germany, has given an interview “EU’s climate policy has lost its scientific basis”. He explains that the specific target that developed countries should aim for at least an 80% reduction in emissions by 2050, which was explicitly stated in IPCC AR4 (2007), is not present in AR5. This means that there is no longer any basis for EU emissions reduction policies targets. The relevant section of AR4 is this table on page 776, chapter 13. (thanks to Oliver for pointing me to this – I had never been sure where these targets came from). In the latest IPCC WG3 report published in full yesterday, there is no such table with specific targets. The relevant chapter is again chapter 13, where there are only rather vague discussions of “Climate policy architectures” (Sec 13.4) and proposed policies in Sec 13.13.2. From the UK perspective, this is very relevant for the UK Climate Change Act. The act was passed in 2008, a year after AR4, and proposes exactly the same target as in the above table, an 80% reduction from 1990 levels by 2050. Since there is no equivalent statement in AR5, it appears that the IPCC has undermined the basis for the Climate Change Act. The report of IPCC WGIII, Mitigation of climate change, is now out. The Summary for Policymakers (released on April 13) starts with a useful definition of what they mean by mitigation: “Mitigation is a human intervention to reduce the sources or enhance the sinks of greenhouse gases.” But the first of the key points listed sets the tone of vague waffle and political correctness: “Sustainable development and equity provide a basis for assessing climate policies and highlight the need for addressing the risks of climate change”. There is talk of “value judgements” and “other societal goals”. The report claims that without mitigation we will have a temperature rise of 3.7 to 4.8°C by 2100 (relative to “pre-industrial”) of which we have had 0.6°C. In other words they are predicting 3.1 to 4.2°C rise this century. They even claim “high confidence” in this statement. The fact that there has been no temperature rise at all over the first 1/7th of the century does not seem to be a concern to the IPCC authors, since they don’t mention it. There is an excessively long account of different scenarios and the associated claimed temperature rises. When it comes to the details of what mitigation actually means, the report is very vague. There is talk of energy efficiency and behaviour changes. Nuclear power is mentioned, but very hesitantly, with a list of of “barriers and risks”. The report is also rather hesitant about CCS, saying only that it could reduce emissions. They are surprisingly positive about switching from coal to gas, describing it as a “bridge technology”. There is a final section on “International cooperation” that is very vague, saying that the Kyoto Protocol “offers lessons”. The BBC discusses the WGIII report under World must end ‘dirty’ fuel use. The Guardian reported the press conference and summarised responses from carefully selected on-message commentators, and then issues a desperate self-righteous call to arms from Leo Hickman. The Mail picks up on the surprising IPCC endorsement of gas and fracking. Robert Wilson criticises the report, saying that “the IPCC needs a good kick up the arse”, in regard to what it says about bio-energy. James Delingpole says that the report is ordering us to give up meat, coal, oil, growth and sovereignty. When the SPM was first released, it was directly available. But on 15 April, the following bizarre statement was placed on the page: The designations employed and the presentation of material on maps do not imply the expression of any opinion whatsoever on the part of the Intergovernmental Panel on Climate Change concerning the legal status of any country, territory, city or area or of its authorities, or concerning the delimitation of its frontiers or boundaries. In order to get the SPM, you have to click “I agree” to proceed. The main report was published a couple of days later, 15 April. Again, you have to “agree” to the disclaimer to get access to the full report. There are 16 chapters, starting off with the vague concepts mentioned above (“Sustainable Development and Equity”) and going on to the more specific topics of Energy, Transport, Buildings and Industry. that says: “For a long time, nearly all climate policy has focused on mitigation. Now, with some change in climate inevitable (and a lot more likely) there has been a shift in emphasis to adaptation”. Andrew Lilico and Robin Guenier might be interested to see this. Warren Pearce and Brigitte Nerlich, from the University of Nottingham Institute for Science and Society, in collaboration with two researchers from Amsterdam, have published an interesting new paper looking at the twitter response to the launch of the IPCC WG1 Report (see also MSP blog post). They collected tweets sent between September 17th and October 8th 2013 (recall that the IPCC Summary report was published on Sept 27th). They included all tweets containing the term IPCC, whether or not they used the hashtag #IPCC, giving over 150,000 tweets. They then weeded this down (for example removing those that were about police complaints, and removing duplicates, retweets and ‘via’ tweets). They then cut down the number further, by focussing on ‘conversational’ tweets, i.e. those that included another @username, bringing the number down to about 60,000, involving about 11,000 twitter users. There is a thoughtful discussion of ethical issues, where they say they decided not to mention any individuals in the paper, as doing so may “have unwanted side-effects” and “may bring them unwanted and disproportionate attention from those holding opposing views”. A lot of nonsense could have been avoided if such ethical considerations had been adopted more widely. For the 239 most connected twitterers, a network analysis was carried out, giving colour-coded network diagrams. Some tweets were generated by a one-click campaign by an NGO called Avaaz – but apparently these don’t really influence the results. The network plots are colour coded and grouped. In one plot (fig 3), the colour indicates different types of communities; I don’t fully understand this (I guess the ‘communities’ are something the software does automatically), but they say that in the UK there are more connections between people with different viewpoints than in other countries. A second figure (fig 4) colour codes the network map according to whether the tweeter was supportive, neutral or critical of the IPCC. About half of the users were supportive, and a quarter critical. These results suggests that there is more ‘intermingling’ from the sceptic side: as they put it “attempts by unsupportive to connect with supportive were not always reciprocated”. In the conclusions there is a nice little dig at a very silly paper by Elsasser and Dunlap who claimed that climate sceptics live in an echo chamber. From the maths point of view, there’s an interesting power law dependence in the graphs in Fig 1 and Fig 2 (the central sections of both log-log graphs form almost perfect straight lines). Overall, I think this is quite interesting, and it studies the subject with a scientific, data-driven objectivity, which is more than can be said for some of the social science research in the field. As with Amelia Sharman’s paper on the sceptic blogosphere, some will say “we could’ve told you that”, but it’s good to see large data sets confirming general impressions. Frontiers did not “cave in to threats”; in fact, Frontiers received no threats. The statement goes on to confirm what critics of the paper said about it in their complaints. Frontiers came to the conclusion that it could not continue to carry the paper, which does not sufficiently protect the rights of the studied subjects. Specifically, the article categorizes the behaviour of identifiable individuals within the context of psychopathological characteristics. We take this opportunity to reassure our editors, authors and supporters that Frontiers will continue to publish – and stand by – valid research. But we also must uphold the rights and privacy of the subjects included in a study or paper. So they are saying that the paper was not ‘valid research’. “The labelling of named individuals as conspiracy theorists in the text and accompanying table is contrary to the ethics of your field which requires individuals to be treated with respect. Most of the excerpts listed as espousing conspiracy theory are no such thing. They merely point out errors and bias in his procedures. His response to criticism is to label his critics as conspiracy theorists. Frontiers issued another statement on 11 April, Rights of Human Subjects in Scientific Papers, which reiterates the vindication of Lewandowsky’s critics. They say “It is well acknowledged and accepted that in order to protect a subject’s rights and avoid a potentially defamatory outcome, one must obtain the subject’s consent if they can be identified in a scientific paper” and go on to add “While the subjects and their statements were public, they did not give their consent to a public psychological diagnosis in a scientific study. Science cannot be abused to specifically label and point out individuals in the public domain.” Anthony Watts notes that “Frontiers agrees” with his complaints.